Werth Messtechnik presents the latest innovation in its extensive selection of sensors: with the Chromatic Focus Line (CFL) sensor, entire work piece geometries are captured rapidly. Using different lenses, the measurement uncertainty and range can be adapted to a particular application. 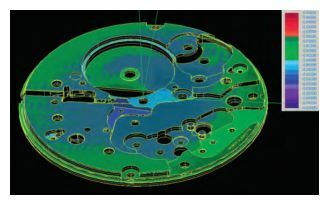 Due to the large axial measurement range, exact tracking of the work piece geometry is unnecessary, so large areas can be rapidly and easily captured by scanning. Work pieces with large variations in height may be scanned along a predefined 3D path. The Chromatic Focus Line sensor measures work pieces with diffuse, reflective, and transparent surfaces, as well as surfaces with large inclination. The CFL projects a series of about 200 white light points onto the surface of the work piece. The light reflected from the surface is spectrally analyzed to determine the distance between the sensor and the surface. This new linear sensor is the first to be able to perform a complete 3D capture of the work piece with both high accuracy and high speed. It measures about one million measurement points in three seconds.